Madison's AMC 6 and former Sundance theater is becoming a screwy social-media legend. It doesn't matter all that much whether a local business is good at using Twitter, despite what social media snakeoil strategists might tell you. But some places run their accounts into the ground so thoroughly and so memorably that they deserve to at least become footnotes in Madison history. Anyone else remember when Monona restaurant Crema Café tweeted "BOW TO THE CREATOR!" back in 2015? Such is the case with the six-screen movie theater at Hilldale Shopping Center. It opened in 2007, optimistically enough, as part of the Sundance theater chain, then just last year became the AMC Dine-In Madison 6. Through all that, it's been the best option in a town that sadly lacks a centrally located first-run theater. 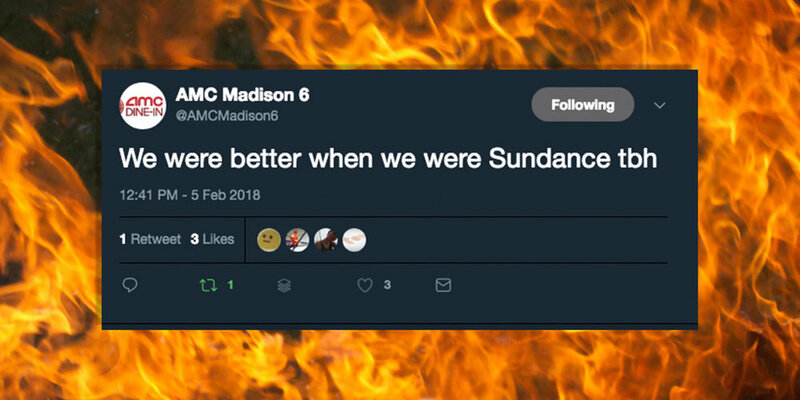 It has also treated us to a long-running comedy of errors on its Twitter account, which started in 2009 as @sundancemadison and was renamed @AMCMadison6 last year. It turns out AMC higher-ups didn't even know about this Twitter account, even though it legitimately tweeted out information about the ownership change last year. But the account was never taken down, nor did it share information referring followers to another local or corporate AMC account. "The theater should not have been running the account. All of our social media is handled centrally from AMC corporate," says AMC spokesperson Ryan Noonan from the chain's headquarters in Leawood, Kansas. "Our theaters, per policy, do not operate their own social-media accounts...it was doing it without authority or oversight from AMC Theatres." Before we go much further, I should say to all the folks who've run this account over the years: I and a few other local journalists owe you a dinner or something for having tormented you over very small things here and there. You no doubt had better things to worry about than Twitter, and generally succeeded in making your theater a comfortable place to see movies and enjoy above-average movie snacks. That said, the social media has been such a glaring afterthought to your marketing. Sometimes the account just doesn't do much of anything. Sometimes it's perfunctory. Sometimes it gets a little emotional while defending a new snack, or gets huffy in the face of criticism. Sometimes it goes ages without posting anything, only to start back up again by literally tweeting "Hello, Twitter World!" This week, though, for a short and shining moment, the account went full-on hashtag resistance. On Monday, some disgruntled employee or perhaps a former employee who still had the password logged in and tweeted "We were better when we were Sundance tbh," shared comments from unhappy customers, and at one point ominously told a follower: "don't underestimate this account." It took a few hours for the overlords to wrest control and delete this first round of offending tweets. But they didn't finish the job. A few hours after the initial rogue tweets were deleted, the account started getting all sassy again, taking on an even more defiant tone. On Monday evening just before 6 p.m., these rogue tweets were also deleted, and the account tweeted the following: "The views and actions on this account today do not reflect AMC as a company. We strive to give the best movie going experience. As a result, this account is shut down and no longer active." It took a bit longer, though, to delete a cover photo with the words "I'll never let go Sundance" superimposed on an image from the Leonardo DiCaprio death scene in Titanic. A few rogue replies remain intact as well. In a direct-message conversation before the second round of rogue tweets was deleted, the person who pranked the Twitter account remained anonymous, but claimed to be a former Sundance employee. If what the person told Tone Madison is true, neither Sundance Cinemas nor AMC, a publicly traded company, had thought to change the account's password in eight years. This points to what has always been the account's problem and/or the secret to its pure magic: No one really seems to be in charge. Despite having been associated with two major cinema brands, including one supposedly all about prestige and curation, the theater's account has always seemed to operate on an amateur-hour, ad-hoc basis with not even the briefest thought put towards anything resembling a social media strategy. You'd expect either company to have a coherent communications plan in place, or possibly even run its Twitter accounts remotely from a corporate office. (AMC is supposed to do both, but missed this one.) If they were doing so, the account might come off a bit sterile, but at least professional and reliable. Instead, it comes off as, well, whatever the theater's own over-worked and presumably underpaid staff and management can muster on any given day. I don't know what actually went on behind the scenes with Sundance or AMC's social-media management—but it clearly wasn't a situation where people were given what they needed to succeed. Whoever you are, rage-tweeter, I can't blame you for wanting to blow off some steam. Perhaps this will be the embarrassment that gets your (former?) employer to clean up its rinky-dink act. And let me know when you want that dinner.